Unfortunately, the negotiations have broken down again. Not good news for Hayward Unified as NCLB [the federal No Child Left Behind] and CA state-imposed high-stakes-testing drives much of the district's planning and threatens the district's future. For a great critique of NCLB and efforts by over 29,000 teachers, parents and community activists united to improve public education check out EducatorRoundtable.org. UESF members are urged to join together to support their bargaining team. The rally is tomorrow, Tuesday, April 24th, from 4:30-6:00 p.m. at SFUSD headquarters(555 Franklin St.). 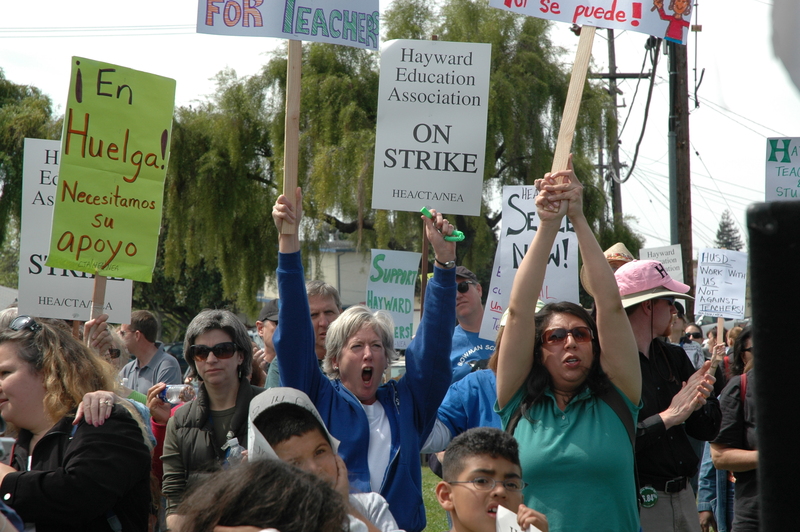 As the Hayward teachers' strike drags on into its third week, we at UESF offer our full support. The brave men and women who have taken a stand for their schools are an inspiration and an example to educators across the Bay Area. We have invited a teacher from Hayward to share her story with us at our rally on the 24th. The "Angry, Tired Teacher Band" from Hayward has also been invited to play at the rally, and they will be there unless there is a settlement in their strike and they go back to their day jobs. Marty Hittleman, the new CFT President, will also speak in support of our contract fight with the district. Please make time attend the rally, and bring your colleagues. We as a union must send a clear message to the district to avoid the mistakes of the Hayward Unified School District, and get moving at the negotiating table. HAYWARD — Teachers union and district negotiators broke off talks Monday night after three hours of struggling to settle their dispute over salaries. "We did not reach a settlement that we both had hoped for," Superintendent Dale Vigil said about 8:45 p.m. "We just need to take some time, and hopefully in the near future we can sit down again and find common ground to reach that settlement." Union leaders said the strike will continue indefinitely. "We thought we had something on the table they could grab hold of and accept," said Kathy Crummey, Hayward Education Association president. "But that wasn't the case." The union is now seeking a salary package revolving around a 12 percent increase phased in over two years. Crummey also said the union proposed a parcel tax during the 2008-09 school year that would go toward increasing teacher salaries. District negotiators earlier had said that if an agreement was not reached during Monday's talks, they would try to force teachers back into classrooms by refiling their application for an injunction that they withdrew over the weekend. School officials Friday filed for the injunction with the Public Employment Relations Board, but the board requested further information from the district and gave it the option to withdraw its application and possibly file for an injunction later. Meanwhile, the 21-day window to hold the state Standardized Testing and Reporting exam began Monday. Hayward Unified has to test at least 95 percent of its students or could face a second year in its "Program Improvement" status. The district received the ranking last year after failing to meet federal moving targets set forth by the No Child Left Behind Act. To emerge from Program Improvement, schools and districts must meet all federal targets for two years in a row. Teachers and the district met for about 10 hours Sunday before breaking off talks at midnight. The two sides were not releasing any details from that session, but "progress" has been made, according to the union. A rally was held by teachers — who chanted "Settle our contract now, I want to go back to class" — and supporters in front of the district office, 24411 Amador St., before Monday's bargaining session began. At about 9:30pm this evening (Wednesday, April 25, 2007) Supt. Dale Vigil announced that the Hayward Unified School District and the Hayward Education Association had reached a tentative agreement, and that teachers would return to their classrooms tomorrow (Thursday, April 26, 2007). He also noted that Thursday would be a minimum day for all students. SF Bay Area STUDENTS FAST FOR A LIVING WAGE! NCLB and Monopoly - who's left behind and why?